Colgate Total 12HR Pro-Shield Mouthwash doesn't just freshen breath, it provides 12-hour protection against germs, even after eating and drinking, helping to keep your mouth healthy and fresh. It kills 99% of germs on contact, significantly reduces plaque and helps prevent the gum disease gingivitis. Colgate Total 12HR Pro-Shield Mouthwash is an alcohol-free mouthwash (does not contain ethanol) and has a refreshing Spearmint Surge flavor. Colgate Total 12HR Pro-Shield Mouthwash Spearmint Surge. ColgateÂ® TotalÂ® 12HR Pro-Shield*â¢ Spearmint SurgeÂ® Mouthwash. Kills 99% of germs of contact. 12-HR protection against germs*, even after eating and drinking. To promote healthy teeth and gums, use after brushing with Colgate TotalÂ® advanced toothpaste and toothbrush. Uses: Helps prevent and reduce plaque and gingivitis. *Results improve with continued twice daily use. Stop Use Indications: Ask a dentist if condition persists or worsens after regular use.Keep out of reach of children under 6 years of age. If more than used for rinsing is accidentally swallowed, get medical help or contact a Poison Control Center right away.In some cases, antimicrobial rinses may cause surface staining to teeth. This is not permanent or harmful, and may be prevented by adequate brushing or removed at your next dental visit. Warnings: Ask a dentist if condition persists or worsens after regular use. Other warnings: Keep out of reach of children under 6 years of age. If more than used for rinsing is accidentally swallowed, get medical help or contact a Poison Control Center right away. Cap sealed with printed band. Inactive Ingredients: Inactive Ingredients: Water, glycerin, propylene glycol, sorbitol, poloxamer 407, flavor, potassium sorbate, sodium saccharin, citric acid, sucralose, FD&C green no. 3, FD&C yellow no. 6. Ingredients: Active Ingredients: Cetylpyridinium Chloride (0.075%). Purpose: Antigingivitis/Antiplaque. Inactive Ingredients: Water, Glycerin, Propylene Glycol, Sorbitol, Poloxamer 407, Flavor, Potassium Sorbate, Sodium Saccharin, Citric Acid, Sucralose, FD&C Green 3, FD&C Yellow 6. Instructions: Adults and Children 12 Years of Age and Older: Rinse for 30 seconds with 240 ml (4 teaspoonfuls) twice a day. Do not swallow. Children 6 Years to Under 12 Years of Age: Supervise use. Children Under 6 Years of Age: Do not use. 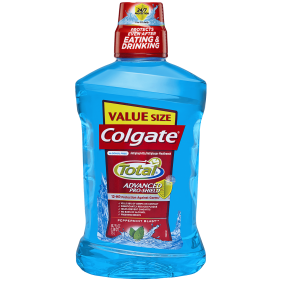 When looking for a mouthwash to add to my oral hygiene routine Colgate total turned out to be the most effective for many reasons. I tried countless brands some left a film in my mouth some didn't freshen my breath for the entire day some gave me dry mouth etc. This mouthwash did everything with a clean taste and an unabrasive formula. Also when I went to the dentist after using this mouthwash for a few months the hygienist commented on how clean my teeth were and how little work there was to do as there was no build up. I never heard this before and this mouthwash was the only change I had made. Thank you for this great product! I can unscrew the lid!!! Thank you Colgate!!!! Not only do I really like the product but the biggest reason I buy this product is because I can unscrew the lid! Other manufacturers had lid that you have to press in the sides of the cap and then try to turn it....and I don't have sufficient strength to do that. So again Colgate thank you!!!!!!!! !